Settlers in Thunder Bay have a very important role to play in challenging settler colonialism and racism in this city. The nature of settler colonialism is to reassert itself in the form of backlash once challenged. While Indigenous peoples speak for themselves and challenge settler colonialism on their own terms, settlers in solidarity can challenge it without the same kind of backlash. So while Indigenous peoples may experience more physical violence than settlers when challenging settler colonialism on their own, there will be less physical violence directed at Anishinaabeg when settlers join in the work of directly challenging colonialism. But so far, it has largely been Anishinaabeg who have been doing the work in this city. That needs to change. Judging by the responses I’ve been getting from settlers since my interview with CBC Superior Morning, there is indeed a willingness to establish an outspoken Thunder Bay solidarity group to support Anishinaabeg in challenging settler colonialism. So, I wanted to share some ideas at the outset, should you folks decide to get together and take some of the weight off of Anishinaabeg in fighting the backlash so clearly evidenced under the #RelaxTamara Twitter hashtag. Anishinaabeg speak for themselves. The role of settlers in solidarity is to support Indigenous peoples, not speak for them. Again, this is not a racialized issue, as many non-Indigenous individuals have been taken in by Indigenous nations. If you have not been taken in, don’t speak for Anishinaabeg. Speak for yourselves as settlers working to undo settler colonialism. Harsha Walia’s work, as well as Nora Burke’s piece may help you figure out the boundaries and responsibilities. De-center the state. As mentioned in Part 1, trying to address settler colonialism by operating within the state’s “permitted” discourses will only lead to defanging your work. The state rewards those who take the path of least resistance. The work of dismantling settler colonialism is inherently related to dismantling the settler state because the Canadian state, as it is constructed today, is built on and perpetuates settler colonialism. This does not mean that the goal is to destroy “Canada,” but rather to decolonize it. De-centering the state in your work means entering into a direct relationship with Anishinaabe sovereignty. On this point, Nora Burke’s words are salient: “A decolonisation movement cannot be comprised solely of solidarity and support for Indigenous peoples’ sovereignty and self-determination. If we are in support of self-determination, we too need to be self-determining. It is time to cut the state out of this relationship, and to replace it with a new relationship, one which is mutually negotiated, and premised on a core respect for autonomy and freedom.” Michele Carey has said something similar in her dissertation based in Australia. Be ready to feel uncomfortable. Your project is a matter of unsettling the settler within (see here). If you’ve grown up comfortably in this settler society, you’ve probably gotten used to not having your ethnicity put on the table, or the ways in which you benefit from the historical genocide of Indigenous peoples questioned. If you shut down discussions simply because you’re feeling uncomfortable about how you’re complicit with settler colonialism, you’re making it about you; you’re foreclosing the chance to decolonize; you’re making it “safe” for colonialism again. Leonardo and Porter’s article is helpful in wrapping your head around feeling uncomfortable. Don’t make Anishinaabeg do the work for you. It is totally unfair to rely on Anishinaabeg to tell you how to decolonize. They are burdened enough with survival, restrengthening their intellectual, political and legal traditions in the face of intergenerational effects of colonial violence, and facing daily the reality of being marked for extermination. Solidarity work is not about voyeurism. This doesn’t mean Anishinaabeg can’t or shouldn’t remind you of basic facts like treaty responsibilities and Indigenous sovereignty. But you need to get together with other settlers, do the research, and solve your own internal dynamics so that you can get to the front line with us when we need you most. Don’t “bliss out.” Many Indigenous individuals are colonized, too, and will do/say things that don’t challenge settler colonialism. This is indicative of a “colonial mentality”: the colonized may actually come to protect the colonial order. Therefore, be critical. Like any other human beings, Anishinaabeg can sell-out. Work with Anishinaabeg that you feel have a handle on settler colonialism, whether they use that language or not. Don’t let your energies be used by those who want to keep Thunder Bay safe for the status quo. Examine and undermine “complicity,” rather than “privilege.” I really can’t describe this any clearer than Beenash Jafri, so just “Pass Go” and read her work directly. Contact other Settlers in Solidarity groups. There is no need to reinvent the wheel. These groups exist in one form or another in Toronto, Winnipeg, Vancouver, Montreal, and other locales. Make those connections to learn from their successes and failures. Google is like a singles bar for this stuff. Don’t start a Facebook group. As Jill Luke writes, “Liking, posting and commenting makes you feel like you’re doing something without actually making any difference whatsoever.” What’s more, in Thunder Bay, making solidarity work a matter of a Facebook group will only drain your energies in trying to convince haters that racism even exists. And while there is nothing wrong in using social media to communicate, educate and plan, settler solidarity work needs to be embodied. Get together in person as much as possible. There will be other issues for you to consider as well. Being an ally is anything but easy work. But that does not mean the work shouldn’t be done. Tell each other the things you’ve been telling me over the past 48 hours. You have a lot of potential to change the conversation in Thunder Bay. As we head into crunch time for the Ontario election, much has been said about Indigenous peoples in northern Ontario, and why they should give up their identities as Anishinaabeg to be “equals” with Canadians. This rhetoric has been led by Tamara Ward Johnson of the Ontario Libertaryan Party, and her merry band of racists. That band has included the likes of Michele Tittler – a known Vancouver-based internet bully – who has no valid reason for participating in local discussions about MPP selection, other than to act as a puppeteer and ideologue for anti-Indigenous sentiment. That said, it’s important that the discussion moves forward; diagnosing racism in statements that otherwise seem to be common sense is a necessary step, which we have effectively done under the #RelaxTamara hashtag. But we also need a strategy to move beyond diagnosis – and that strategy is to centre Anishinaabe sovereignty. To recap, I have been active on social media in addressing the illogics of Tamara’s positions on equality, but it makes sense to recap them here briefly to bring that conversation together. When Tamara and Michele speak of “equality,” what they’re actually saying is that Indigenous peoples need to be more like white people. Equality as they use the term makes whiteness invisible – it becomes the yardstick by which every person who does not identify as “white Canadian” is measured. This is racist because it demands assimilation: Indigenous peoples should be “equal” only by giving up their historical and on-going treaty relationship with the Crown. It demands a complete revision of the history that has produced Canada as a country. Such revision requires a colourblind approach to race relations, which is racist in and of itself because it hides the power of whiteness in a white supremacist society, such as Canada. True equality is found in what is at least a dual-step process. It requires undermining whiteness as a power construct, so that Indigenous peoples’ intellectual, legal and political traditions may be expressed without fear of retribution. Anything less only leaves the problem – white supremacy – intact. But it also requires a restrengthening of Anishinaabe sovereignties. And this is something that both Anishinaabeg and non-Anishinaabeg folks can do. Many people have been asking this in one way or another over the past weeks. To me, the next step is to de-centre Tamara Ward Johnson and to strengthen our relationships to Anishinaabe sovereignty. It is to refuse the fetishization of conflict (which is Tamara’s strategy), and a matter of supporting the resurgence of Anishinaabe law. How can we do this? In a fabulous dissertation about decolonizing identities in Australia, non-Aboriginal scholar Michelle Carey writes that settlers can develop a non-colonial identity in ways that put them into a relationship with Aboriginal sovereignties. She says that to undermine the power of whiteness requires that whiteness be removed from the solution. She makes a call for settler peoples to move past the false dichotomy of white vs. black, and into one of non-Aboriginality. By identifying as “non-Aboriginals,” settlers centre Aboriginal people in their identity. They become settlers-in-relation-to Aboriginal people, living in a relationship with Aboriginal sovereignties. This is key because too often whiteness gets reproduced in dialogue meant to undermine it. In northern Ontario, settlers might begin to identify as non-Anishinaabeg. This decentres the role of the Canadian state in our discussions about building a future based on equality. It centres Anishinaabeg sovereignty. It centres the fact that as non-native people, you have a treaty right to live within Anishinaabeg territory, and that this is an expression of Anishinaabe sovereignty. In other words, it would transition your identity from a colonially-produced one (e.g. “Canadian,” and/or “white”), towards one that undermines the colonial relationship that continues to oppress Indigenous peoples more broadly. Key to this is Anishinaabe Sovereignty. Anishinaabeg are sovereign peoples. Through their political orders, they opted to enter into treaties with the Crown. It is through these treaties that settlers gained the rights to live within Indigenous territories. The Robinson-Superior Treaty of 1850 is an expression of that sovereignty – it did not delegate our self-determination; it is an expression of it. Yet, through specious arguments for “equality” as put forward by the heroes of #WhiteBacklash, this historical relationship is to be obliterated so that, in Tamara Ward Johnson’s words, companies can have guaranteed access to resources in Indigenous territories. I am speaking here directly to non-Anishinaabeg settlers living in Anishinaabe Aki. My reasons for doing so is that I highly doubt any Anishinaabe person will vote for the Tamara Ward Johnson; but I assume some settlers are looking for better answers than she is providing. This is especially concerning if we assume Tamara will run for a seat in the next Thunder Bay municipal election. And so, the best thing I can say to you is this: don’t put yourself on the wrong side of history. Move beyond the relationship created for you by a colonialist history, and shored-up by people like Tamara Ward Johnson and Michele Tittler. An anti-colonial approach to equality requires the resurgence of Anishinaabe sovereignty, and one way to do that is to put yourself in a relationship with it. The following paper was delivered at the Symposium on Decolonial Aesthetics from the Americas, 10-12 October 2013, Toronto, ON, and as part of Lakehead University’s 2014 Aboriginal Awareness Week, 20 March 2014 in Thunder Bay, ON. As is the case for many Indigenous nations in Canada, Anishinaabeg practices for discerning belonging have been re-imagined along colonizing logics of Indianness. In other words, being and belonging with Anishinaabeg, has become a matter of whether one fits into settler society’s projection of what an Indian is. For the Anishinaabeg of the northern shore of Lake Superior, evidence of this intrusion was first witnessed in the signing of the Robinson-Superior Treaty in 1850 where, representing the Queen of Great Britain, colonialists argued that only those people who were racially pure ‘Indians’ could receive benefits of the treaty. These race-based notions of Indianness were woven into Canada’s Indian policies, effectively inventing Indian in law and then penalizing anyone marrying non-Indians by removing Anishinaabeg individuals from Indianness over time. This dismemberment has worked to exclude up to two million Indigenous individuals from their nations across Canada today. Much has been written about the troubles caused by the invention of Indianness in law. Bonita Lawrence’s study “Real” Indians and Others traces the complexities and contradictions that Indian status causes in urban Indigenous communities, showing that Indigenous peoples can actually reproduce the very logics used by the state to write them out of existence when trying to reclaim control over belonging today. Elsewhere, Pamela Palmater has shown us how Canadian Indian policy works to exterminate Indians and Indian bands. Palmater shows that imagining Indigenous identities and belonging along the lines of blood quantum will lead to what she calls “legislative extinction,” a situation where Indigenous peoples will continue to exist, but as non-Indians. Anishinaabeg, like other peoples, do not parent exclusively within their so-called “race.” Intermarriage results in the dilution of Indian blood over time. And so, according to Canadian law, once there are no more Indians, there will no longer be a need for Indian bands (or reserves). In this way, the regulation of family-making allows the state to move ever-closer to exploiting what resources remain in Indigenous territories. In other words, the regulation of Indianness is a project of termination. All that said, Anishinaabeg are not creations of the Indian Act. Our legal and political orders exist outside of Canadian law; they are sui generis. We can look through these orders to see the world through Anishinaabeg eyes. Doing so is simultaneously an act of resistance, resurgence and a performance of intellectual sovereignty. And so, today I want to focus on what Anishinaabe law has to say about what it means to be belong with Anishinaabeg. Whereas more than a century of Indian policy has made us think that belonging is a matter of Indian status, or solely a matter or racialized Indianness, Anishinaabe law says that belonging is a matter of family-making. When one belongs with a family, whether through marriage, adoption, or birth, one carries responsibilities. Those responsibilities are to people, but they are also to the land. It is my experience, as someone who belongs with Anishinaabeg through adoption, that family-based customs for discerning belonging dispel the race-based logics that have come to grip Anishinaabeg communities. Signed at Sault Ste Marie on what is currently the Canadian side of the border on September 7 and 9, 1850, respectively, the Robinson-Superior and Robinson-Huron Treaties embodied and reflected the nation-to-nation relationship between Anishinaabeg and the Imperial Crown. Overt racism was vogue at the time: the colonialists saw Anishinaabeg as a dying race. Race in and of itself was believed to be an immutable difference between settlers and Anishinaabeg, and so racial mixing was perceived negatively as a threat to the purity and righteousness of the (white) Imperial global order. Representatives of the Imperial Crown deployed racial discourses in the treaty negotiations in at least two ways: first, in conducting a unilateral census before the treaty, the commissioners distinguished between ‘full blooded Indians’ and those they identified by phenotype as ‘half breeds.’ Their goal was to exclude all half-breeds from the treaty. This form of racism presumed not only the ability to discern who belongs with Anishinaabeg communities solely on phenotype, but also asserted a hegemonic logics of identity formation. Part white, half-breeds had less a claim in Anishinaabeg sovereignty than those deemed ‘full bloods,’ simply because of their biological heritage. In other words, what we see here is that nationality was being tied to biology through a politics of recognition. Second, the commissioners made the treaty contingent on logics of an ever-decreasing racial purity. The ‘dying race’ logic was used against Anishinaabeg; colonialists took it as only a matter of time before blood lines were diluted ‘enough’ through intermarriage with white settlers, to the point that all Anishinaabeg communities would be classified as ‘half breeds,’ thereby voiding the treaty. The commissioners, and the colonialists after them, thus attempted to hijack family-making practices, such as birthing, adoption and marriage, claiming them as methods for assimilation. As Ann Stoler notes about the British in other colonial contexts, family-making was targeted because it as the level of the family that new bodies are made and taught how to be Indigenous. Racialized approaches to protecting the “purity” of the European Master Race fostered settler anxieties about mixed parenting patterns within the British colonies. This resulted in laws discouraging mixed parenting between “natives” and Europeans. Claiming halfbreed Anishinaabeg bodies into the settler body politic was a form of attenuating settler anxieties within the colony; it made them non-Indian, while also having the ancillary benefit of removing more Indians out of the way of settlement. In North America, it was the idea of blood quantum, whether explicit or implicit in policy, that answered the colonialists’ call to protect pure Europeanness from the racial contamination created by mixed parenting. Blood quantum establishes a system of control based on mathematics where an Anishinaabeg person can cease to be Indigenous in the eyes of the law, effectively assimilating into Canadian society in a legal sense. By measuring one’s quantum of Indian blood, colonialists could police and silence those who had legitimate claim to lands the settler society was attempting to dominate. Canada’s Indian policies evolved with these raced logics in mind. Though not mentioned explicitly in current Canadian Indian policy, blood quantum is nonetheless still at play in our belonging practices. Worse, many First Nations have reproduced the terminal creed of blood quantum. As of 2005, of the 11 Anishinaabeg communities within the Robinson-Superior Treaty territory, nearly 100% were still using race-based logics to discern belonging. By contrast, we have our own legal orders that consider belonging and identity along a spectrum of Anishinaabe-ness. The Anishinaabeg word for colonialism is zhaaganashiyaadizi, translated as to live one’s life like a white person at the expense of being Anishinaabeg. Zhaaganashiyaadizi differs from Indianness because it speaks to a fluidity around identity not apparent in Indian discourses predicated on the stasis of one’s genetic make-up. As Leanne Simpson writes, zhaaganashiyaadizi is relative and based on one’s choices – not one’s race. Potentially anyone is in a spectrum of belonging with Anishinaabeg; what matters is whether a person lives according to Anishinaabe laws, and carries-out their responsibilities towards Anishinaabe relatives. We see these responsibilities-based logics at play in part of the Anishinaabeg creation story, where humans were the last beings created, after all the animals and the ecologies. Humans were weak because they did not know how to survive. They were in need of help. The animals, who already knew how to live on the earth, decided to care for these new humans. They had the ability to do so, and they took them into their nations as adopted family members. It didn’t matter that they looked different than, say a bear or a deer. What mattered was exercising a responsibility to care for all of creation, and for families to promote mino-bimaadiziwin, or continuously renewing life in a balanced way. I can see myself in this story. It makes sense to me as an adoptee. I was adopted into Fort William First Nation as a baby through the custom adoption practices my grandmother, Geraldine MacLaurin-ba carried with her throughout her life. Phenotypically, I am white, but I grew up on the reserve as part of my family and community. Like the humans in the creation story, it didn’t matter that I looked different than my dad and his family. And while we cannot overlook the fact that settler society does not mark my my body for extermination as it has family and people of colour, the values underpinning adoption nonetheless animate a sui generis logics of belonging that challenges Canadian regulation of what it means to belong with Anishinaabeg today. Anishinaabe artist and curator Wanda Nanabush writes that Indigenous artists tell the story about their peoples in the face of degrading colonial narratives. In other words, the work of Indigenous artists is decolonizing because it inherently challenges the normalizations spun to make the world safe for colonialism. Christian Chapman’s Past, Present and Future questions the normalization of race-based belonging in ways that draw together our treaty relationship with the Crown while also asserting the contemporary validity of Anishinaabeg legal order of discerning belonging. The images of Queen Elizabeth as a young queen (the past), then again as an older Queen (the present), are juxtaposed with an image of Kate Middleton, the Duchess of Cambridge – most likely a future Queen. The women in the three images are re-dressed in Anishinaabeg aesthetic; in each image we see a spirit circle, an element common to Anishinaabeg ‘woodlands’ art symbolizing our connection to the ecology-spirit world. Chapman honours continuous renewal here as the three images are points within a circle of family-making. Kate Middleton will one day take the place of Queen Elizabeth of the past (on the far left); this process opens spaces for in-coming generations who will take Kate’s current place on the right. Kate’s connection to the young Queen Elizabeth on the far left is established through marriage to the unseen grandson, who is somewhere behind the Queen of the present. What makes Kate belong to the family is her relationship and responsibilities, not her blood. These logics of adoption demonstrate that Anishinaabeg family-making practices transcend race-based logics of belonging. In Chapman’s work, as in Johnston’s writing, we see the Queen and Duchess being claimed as family members, both politically and personally. The bonds are based on teachings such as acceptance of difference, humility, caring for others, non-hierarchy and mutual success. Looking at Chapman’s work from a different perspective unfolds another layer of Anishinaabeg belonging orders. In addition to adoption, Past, Present, and Future also represents family-making through birthing. Birthing is a symbol of continuous renewal of the nation; it is a sign of mino-bimaadiziwin. The portrait of Kate Middleton plays on the family-as-renewal narrative found in Norval Morrisseau’s 1975 work entitled Artist’s Wife and Daughter, a piece he painted in conjunction with a self-portrait. When juxtaposed together, we see in Morrisseau’s piece a Wife holding a Daughter, symbolizing the renewal of life into the next generation; in Chapman’s piece, we see Kate anticipating a child. Chapman includes the next generation here by placing a spirit circle in front of Kate where Morrisseau’s ‘Daughter’ is located respectively. Like the Duchess in the image, we are all anticipating the arrival of the next generation of those who belong with our families and communities. This makes even more sense when we view Morrisseau’s Self Portrait and Artist’s Wife and Daughter together. This is not to assert a heternormative, monogamous family model, but in this instance it is one model through which Morrisseau chose to emphasize continuous renewal through family-making. In this original juxtaposition, Artist’s Wife and Daughter emphasizes the importance of the family within Anishinaabeg constitutional orders. The family is the nation because it is through the family that people come to belong with the land and other Anishinaabeg. This is why our treaties are discussed as adoption ceremonies: the principles underpinning treaty-making are based on the principles underpinning family-making. Read together, Chapman and Morrisseau’s portraits assert not only the continuous renewal of Anishinaabeg in a physical sense, but speak metaphorically to the continued existence of Anishinaabeg constitutional orders that house our philosophies for discerning belonging. As James Sákéj Youngblood Henderson has shown, if an Indigenous nation does not clearly surrender in treaty a right or responsibility, that responsibility remains within the jurisdiction of the Indigenous nation. Further, Anishinaabeg constitutional orders are not designed to automatically surrender aspects of sovereignty when we enter into treaties with other nations. No where in the Robinson-Superior Treaty does it state that Anishinaabeg surrender the responsibility to discern who belongs, and therefore our legal orders to do so are still in place despite the states’ unilateral assertion of its race-based Indian policies. We see the continuation of our orders for discerning belonging in the portrait of Kate Middleton: dressed in Anishinaabeg aesthetic, she and her yet unborn child are being brought into Anishinaabeg belonging through our treaty-family relationship despite their low quantum of Indian blood. 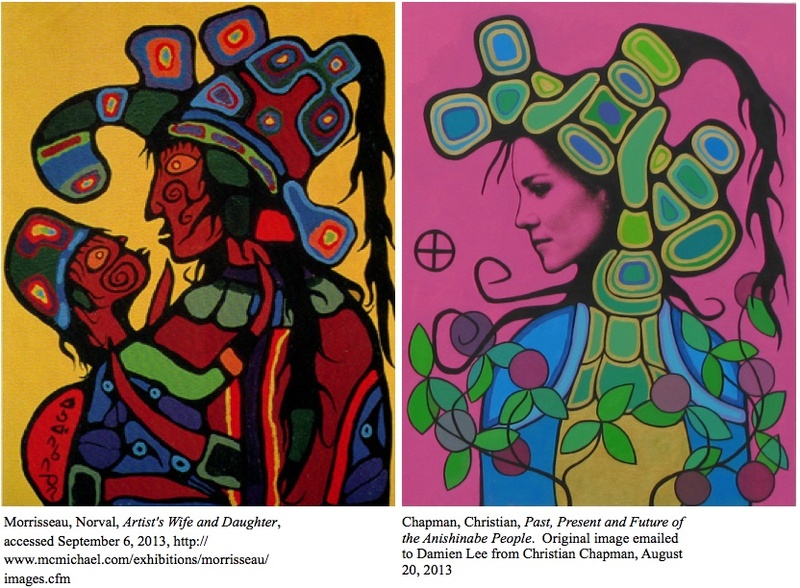 Chapman’s work thus upsets the colonial narrative that says Anishinaabeg have no political or legal orders. What Chapman’s work does is it reminds us that we have our own customs for discerning belonging that are nested within sui generis legal orders. It centers the family as the decision maker when determining who belongs and who does not. It reminds us that such orders survived colonialism, particularly at the family level. To me, Chapman’s Past, Present, and Future of the Anishinabe People pushes back on the colonial narrative that says belonging is a matter of being a racially ‘pure’ Indian, thereby challenging us more broadly to re-examine the ways our social order relies on race. I believe we can we can use the legal orders for discerning belonging as found at the family level to re-think how belonging is discerned at the national level. I believe the family-making practices used by Anishinaabe families today can re-articulate at the community or national levels to reclaim control over belonging in resurgent and decolonizing ways. In this, Christian’s work, and other stories about marriage, birth and adoption challenge us to see past the racialized notions of Indianness. To belong, is to be part of a family, not whether one holds a status card. Pamela Palmater argues that the philosophy of “blood quantum” is at play in the provisions of the Indian Act that determine whether one is an “Indian” according to the Act, despite the absence of the term in the current version of the Act. See Palmater, Pamela, Beyond Blood: Rethinking Indigenous Identity (Saskatoon: Purich, 2011), 46. Robinson qtd. in Alexander Morris, The Treaties of Canada with The Indians of Manitoba and The North-West Territories Including The Negotiations on Which They are Based, and Other Information Relating Thereto (Toronto: Willing & Williamson, 1880), 19.
the number of Indians entitled to the benefit of this Treaty shall amount to two thirds of their present numbers (which is twelve hundred and forty) to entitle them to claim the full benefit thereof, and should their numbers at any future period not amount to two thirds of twelve hundred and forty, the annuity shall be diminished in proportion to their actual numbers. Stoler, Laura Ann, Carnal Knowledge and Imperial Power: Race and the Intimate in Colonial Rule (Berkeley: University of California Press, 2002), 81. Stoler, Ann Laura, Race The Education of Desire: Foucault’s History of Sexuality And the Colonial Order of Things (Durham: Duke University Press, 1995), 131-2, 144. Eva Marie Garroutte discuses the purposes of blood quantum as such: “[t]he original, stated intention of blood quantum distinctions was to determine the point at which the various responsibilities of the dominant society to Indian people ended. The ultimate and explicit federal intention was to use the blood quantum standard as a means to liquidate tribal lands and to eliminate government trust responsibility to tribes, along with entitlement programs, treaty rights, and reservations.” Garroutte, Eva Marie, Real Indians: Identity and Survival in Native America (Berkeley: University of California Press, 2003), 42. See Clatworthy, Steward, Estimating the Population Impacts of the E-Dbendaagzijig Naaknigewin, (Winnipeg: Four Directions Project Consultants, 2010), 9. This is not to say that these communities use blood quantum or the Indian status out of choice, as Canada’s Indian policies were forced onto Anishinaabeg; indeed, our communities were forced to abide by such policies in order to access treaty promises. Regardless, generations of woman and their children have been wrongfully removed or barred from their communities because of this history. Geniusz, Wendy, Our Knowledge is Not Primitive: Decolonizing Botanical Anishinaabe Teachings (Syracuse: Syracuse University Press, 2009), 192. Simpson, Leanne, Dancing On Our Turtle’s Back: Stories of Nishnaabeg Re-Creation, Resurgence and a New Emergence (Winnipeg: Arbeiter Ring Publishing, 2011), 52-3. Sium, Aman, “‘New World’ Settler Colonialism: ‘Killing Indians, Making Niggers’,” [Blog post], Decolonization, Indigeneity, Education & Society. Nanabush, Wanda, “Love and Other Resistances: Responding to Kahnesatà:ke Through Artistic Practice,” in This is an Honour Song: Twenty Years Since the Blockades, eds. Leanne Simpson and Kiera Ladner (Winnipeg: Arbeiter Ring Publishing, 2010), 170-3. Auger, Donald, The Northern Ojibwe and Their Family Law [Unpublished dissertation], (North York: Osgoode Hall Law School, York University), Chapter 6. Also see various stories shared by Maggie Wilson in Cole, Sally (ed. ), Rainy River Lives: Stories Told by Maggie Wilson (Lincoln: University of Nebraska Press, 2009). Johnson, Harold, Two Families: Treaties and Government (Saskatoon: Purich Publishing Ltd., 2007), 27-29. Simpson, Dancing on Our Turtle’s Back, 107. As James Sákéj Youngblood Henderson writes about another British-Indigenous treaty relationship, “[a]ny Aboriginal rights or tenure withheld from or denied to the British sovereign in the treaties were vested in the [Indigenous] Nation.” Henderson, James Sákéj Youngblood, “Constitutional Powers and Treaty Rights,” Saskatchewan Law Review 63(2000):720-7. Similarly, the Robinson-Superior Treaty makes specific agreements while protecting Anishinaabeg sovereignty, including sovereignty in discerning belonging. Simpson, Leanne, “Looking after Gdoo-naaganinaa: Precolonial Nishnaabeg Diplomatic and Treaty Relationships,” Wicazo Sa Review 23(2008):38. Root, Maria P. P., “Within, Between, and Beyond Race,” in Racially Mixed People in America, ed. Maria P. P. Root (Newbury Park: Sage Publications, Inc., 1992), 3. 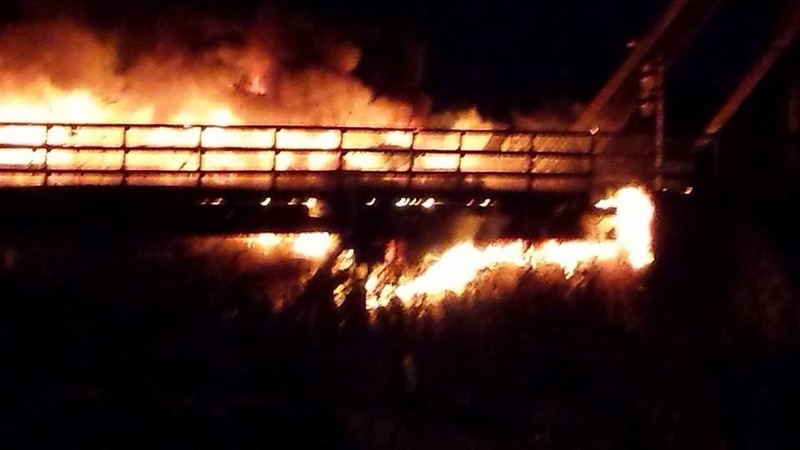 The public reaction to my recent post, Burning Bridges: The Unleashing of White Settler Racism in Thunder Bay in Moments of Catastrophe, heard here and here, has raised a number of questions about eliminating racism in Thunder Bay. The short article went viral within hours of being posted to my blog and to a local online news site, and spurred a plethora of racist responses. Given that the people of Thunder Bay and Fort William First Nation are organizing to address racism in our community, it is important that our next steps account for the ways in which white supremacy reproduces itself even in those acts meant to dismantle it. As such, I felt it important to offer a reflection on what can be learned through a brief analysis of the commentary that followed the posting of the article. Below, I’ve compiled and contextualized some of the more nuanced racist comments Burning Bridges received. This may help the local community recover from the racist violence we witnessed this week, which included the destruction of a tipi at Lakehead University, because it expands the definition of racism beyond only the most violent and obvious forms to include more subtle acts that serve to protect settler colonialism in northern Ontario. While Mayor Hobbs repeatedly stated in the aftermath of Burning Bridges that only a minority of people in Thunder Bay hold racist views, the quotes and analyses below tell a different story; they show that racism, defined broadly, actually structures the discussion about anti-racism in our community altogether. Therefore, if future acts of recovering from racism are to actually address Indigenous peoples/people of colour’s concerns instead of simply allowing the white majority to feel better about themselves by forgetting October 29th ever happened, we need to account for how it manifests in ways other than the most egregious of examples. How Does White Supremacy Reproduce itself in Race Dialogue? Many of the commenters dissenting against the points made in Burning Bridges made claims that the post was an act of “reverse racism,” stating that my use of the word “settler” was incorrect/offensive because, as Canadians, they were “born here,” making them ‘native’ to Canada (this absorption into the landscape is key to understanding settler colonialism) . Others were adamant that Anishinaabeg should just get on with life and stop complaining about a ‘supposed’ racism. Finally, many said that we’re all the same, which is a colour-blind argument saying that Anishinaabeg and Canadians should be unified as people and all will be well. I provide screen-shots of some of these comments below, but first its important to contextualize them. Zeus Leonardo and Ronald Porter say that discussing racism in a white supremacist society is not safe for people of colour. In their view, white people who want to avoid looking racist will take over conversations in ways that silence people of colour from speaking the truth about how they are affected by white supremacy. They say that all this is done to control the space so that it is safe for white people at the expense of those who experience the violence of white supremacy, namely, people of colour (and, I would add, Indigenous peoples). This protects one of the most important foundations of white supremacy: whiteness is always seen as neutral, and therefore any attempt to make it visible as an ethnicity or pre-requisite for power makes white people feel unsafe. Elsewhere, George Lipsitz has looked at how white people try to distance themselves from past racialized violence. He discusses how white students in the US try to undermine the intergenerational effects of slavery. He shows that some white students there argue that they don’t have anything to do with slavery, because it was in the past. This argument is meant to reduce feelings of guilt, while also playing a role in perpetuating the problem: when whites say they’re not responsible for past racialized violence, they’re invisibilizing how they benefit from the actions of their ancestors that structured today’s society in a way that whiteness opens more doors than any other skin colour. As is clear in the responses above, racism can be “subtle” even while seeking to uphold the white supremacist order already in place in Canada. What these comments show is that the road to hell really is paved with “good” intensions. The question is, though: Good for whom? Because racism in Canada is a structural issue (in addition to an individual issue), there is always a risk of reproducing racism in mainstream organizing meant to eliminate it. Mainstream anti-racism organizations and/or committees must thus be vigilant in self-assessing for ways in which they may be complicit in white supremacy and/or colonialism. Just as importantly, white individuals within such organizations must be willing to feel unsafe in their reflection process if they are to understand how their presence may re-assert white supremacy. This is a salient point to end with, since in the aftermath of the public demonstrations of racism in Thunder Bay over the last 36 hours, the City of Thunder Bay’s Anti-Racism Advisory Committee has been discussed as a player in moving us forward. The Advisory Committee is doing good work, and it needs to continue to do so. But if there is anything to be learned from the commentary elicited in response to Burning Bridges, its that the structural element of racism needs to be foregrounded. The Advisory Committee’s extreme focus on “Respect” for cultural difference only goes so far; its focus on respect for difference maintains the “otherness” of non-white people while obfuscating the main problem: whiteness. If it continues down this path, the Committee will not be able to identify and dismantle the ways in which the City of Thunder Bay is implicated in broader structural racism in northwestern Ontario (for example, see Mayor Hobbs’s denial that racism in Thunder Bay is structural, here). This is a question of identifying the City’s blind spots in how it is complicit in an already white supremacist and colonialist environment. The best way to address this is to unsettle the settler within, or come to know and account for mainstream organizations’ complicity in settler colonialism. Thus, in addition to mainstream anti-racism organizing in the area, it is just as important that those most affected by racism are given the opportunity to lead in addressing the problem. This should be given high priority, even if it means yielding to grassroots organizations or local reserves when planning and implementing anti-racist projects. Grassroots groups such as the Regional Multicultural Youth Council should be recognized and supported as leaders in dismantling racism in Thunder Bay. That there was such shocking reaction to the racist tweeting the night of October 29th only tells me that racism in northern Ontario is too readily written-off as individual occurrences rather than understood as a problem that structures the very social fabric of Thunder Bay society. As one commenter put it today, we can learn from this issue to make real change. But that change won’t come if we simply go back to relying on the systems that were already in place before the James Street bridge burned in the night. In response to Horizon Wind Inc.’s proposed Renewable Energy Approval request for the so-called “Big Thunder Wind Park” within the traditional territory of Fort William First Nation, I wish to make the following statement. I am categorically opposed not only to Horizon Wind Inc.’s project proposal, but, more importantly, to the provincial application and review institution governing this (dis)approval process in and of itself. While I am opposed to Horizon’s project proposal because it will negatively affect my community’s ability to access and practice our culture, I cannot even begin to address these concerns when I consider the fact that the application, commenting provisions, and (dis)approval processes have been vested in your ministry at the expense of Anishinabek jurisdiction for discerning land use. The land upon which the Big Thunder Wind Park is proposed is under jurisdiction of the Anishinabek (Ojibwe), particularly the Anishinabek community of Fort William First Nation; this is a jurisdiction we share with Ontarians and Canadians. We, like many other Anishinabek and Indigenous communities, find our spiritual, cultural, economic and political meaning through our relationship with our lands. Such meaning is not limited to the reservation boundary, and yet as a community we have endured more than a century of land loss in the name of settler society’s industrial development. Indeed, the people of Fort William First Nation have lost over 8,630 acres of land through illegal expropriation since 1859. The land we lost was the best hunting and agricultural grounds we had; roughly half of it was used for industrial operations and subsequently severely polluted. This history has shown us that EuroCanadians do not respect our jurisdiction over our lands, nor our understandings about human-environment relationality. Without such an understanding, this (dis)approval process cannot effectively be resolved. Your ministry cannot presume to be an arbiter of land-use decision making within Anishinabe Aki (Anishinabe Territory) without Anishinabek knowledge holders leading the process. Our knowledge holders are fully capable of using Anishinabe knowledge to make decisions about our territory – Western science is an embodiment of a Eurocentric worldview and should not be seen as the only valid perspective on the environment. However, paradoxically, including Anishinabe knowledge in this process, which would be exemplified by including Anishinabek leadership directly in the highest level of decision making, is preempted by your ministry’s assumed jurisdiction over our lands. You will note that as a ministry within the Province of Ontario, the Ontario Ministry of the Environment gains its jurisdiction through the fiction of imperial sovereignty as asserted in the British North America Act, 1867. Sections 91 and 92 of that Act provide that provinces have jurisdiction over the management of public lands. Anishinabek, like other Indigenous peoples, were not consulted and did not consent to such assertion of sovereignty – it existed merely in the minds of colonialists interested in robbing Indigenous peoples of their lands and political autonomy. Against this backdrop, the jurisdiction of the Ontario Ministry of the Environment must be read as a corollary fiction: the provinces assumed the day to day operations of managing (i.e. occupying and exploiting) Indigenous lands. Your ministry, despite its best intentions, is thus complicit with that larger negation of Anishinabek sovereignty to the extent that it does not defer land-use decisions in our territory to Anishinabek knowledge holders. Sections 91 and 92 of the Act defy our understanding of our nation-to-nation relationship with the Crown. It is our understanding that by entering into the Robinson-Superior Treaty of 1850, we were going to share the lands with settler Canadians in a manner that respected each party’s political sovereignty; the creation of Indian reservations as discussed in the Treaty does not negate Anishinabek jurisdiction beyond the reserve boundaries. Further, it should be noted that the Indian Act is not to be used in such a way as to shield the federal or provincial governments from the nation-to-nation relationship embodied in the Robinson-Superior Treaty. As a proposed resolution, I urge the Ontario Ministry of the Environment to refer this matter to the Premier of Ontario, with the express recommendation that a political solution be found to Horizon Wind Inc.’s Big Thunder Wind Park proposal. Such a solution will be valid only to the extent to which the Premier recognizes Fort William First Nation’s responsibilities to decide what should happen within its traditional territory, including the right to refuse industrial projects that it decides will have a detrimental impact on our culture, community, identity, access to traditional foods, and so on. Anishinabek leadership must be directly involved in the highest level of decision making regarding this project.